Ulta Beauty (ULTA) has a great business model that is widely popular across America. It’s Ultimate Rewards program has a staggering 30 million people. This group accounts for 95% of total sales. Wow. These individuals helped boost company sales 16% last qtr as profits jumped 25%. With a P/E of 20, this stock has good upside. Opened 42 stores last qtr, closed 3 and ended the qtr with 1163 stores. Target market of 1400 to 1700 stores in the coming years with plans to open 100 stores in 2018, 80 stores in 2019, 75 in 2020 and 70 in 2021. Ulta.com sales grew 43% and represent 11% of total ULTA revenue. Ulta’s loyalty program Ultamate Rewards has 30.6 million active members, 15% more than a year ago. Loyalty member sales now represent more than 95% of total revenue. Salon sales grew 10% as its new service optimization model is on 30% of the chain, which is composed of (1) top talent compensation, (2) Ulta training by an educator, (3) simplified menus and (4) transparent pricing. Repurchased $119 million worth of shares. ULTA used to deliver profit growth of around 30% per year, and now we have to get used to an Estimated Long-Term Growth Rate of 19% per year, which is down 1% from last qtr. ULTA sometimes comes under pressure when management lowers its long-term growth expectations, or when investors fear Amazon will pressure profit margins. But this stock has already been punished for slower growth. During 2017 ULTA went from a high of over-$300 to a low below-$200. 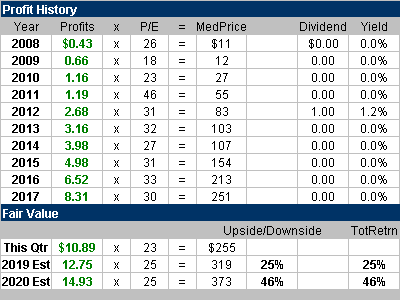 In two qtrs the P/E dropped from 31 to 21, and the stock was then a value, thus it rallied higher. 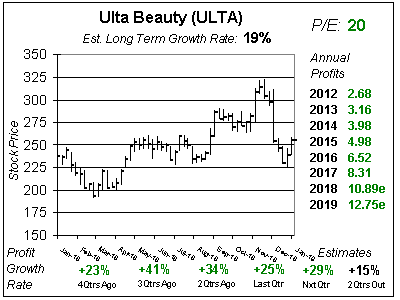 Ulta Beauty is a fine growth stock, and is part of the Growth Portfolio. My 2019 Fair Value is a P/E of 25, which is $319 a share, 25% higher than the recent quote. Now in this chart, qtrly profit growth has been solid the last year. But these numbers god help from a lower tax rate than a year ago. That will continue one more qtr, then its back to reality. TheEst. LTG is of 19% is good. 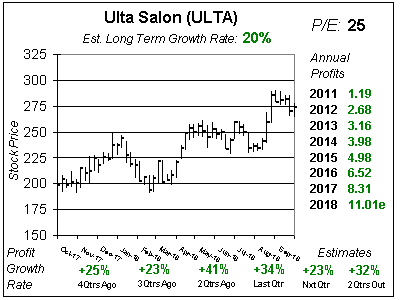 I think ULTA is a high-teens grower, down from being a 25% to 30% grower a few years ago. Growth is good, not great. The good thing is the stock’s less expensive than it had been in the past. ULTA regularly had a P/E over 30 two-to-tree years ago. Now with a P/E of 20 this stock is a good value. Last qtr ULTA had 16% revenue growth and 8% same store sales growth which was composed of 4% store growth and 42% growth in e-commerce sales. Profits grew 25%, and beat estimates of 23%. Annual profit estimates for 2018 and 2019 came down this qtr. It wasn’t by much, but they still declined. So I don’t feel this will be a stock market leader when the market turns from Bear to Bull. 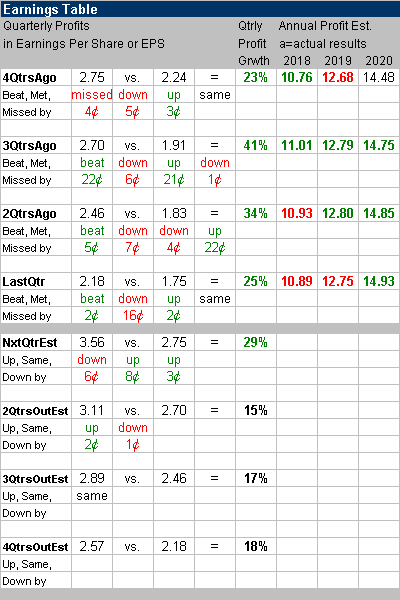 Qtrly profit Estimates are for 29%, 15%, 17% and 18% profit growth the next 4 qtrs. Next qtr’s estimate declined, which I don’t like. That’s the 6th consecutive qtr analysts have lowered next qtr’s estimate. But I do like the high-teens profit growth expected later in 2019. That’s better than a lot of other companies are doing. My Fair Value on this stock is a P/E of 25. The upside for 2019 and 2020 is solid. 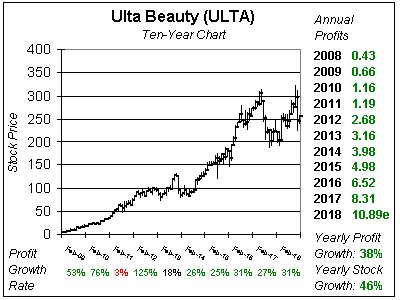 Ulta Beauty (ULTA) went through a pretty bad correction has had some haters who feel the company’s business model isn’t build to last. But the company continued to deliver +20% profit growth and has since turned haters (males?) into believers. Ulta is in touch with its customers, and its unique business model keeps delivering the profits. 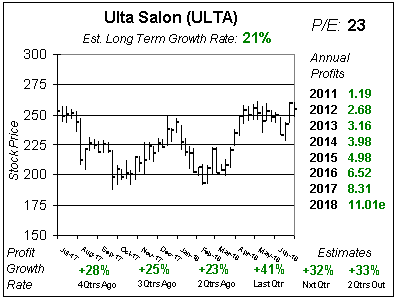 With a P/E of 20, and 17% growth expected in 2019, Ulta Beauty is set up to have a solid year. ULTA drops from 23rd to 29th in the Growth Portfolio Power Rankings. Its nothing against ULTA, I just have a few more stocks I like better right now.